Few astrophysicists get rich—we like to think that we’re devoted to pursuing cosmic truth, not chasing dollars. Don’t even think about dressing like an investment banker at a conference or, for that matter, in class. But, like it or not, our science depends on financial support from other people. A $2.5 billion Mars rover here, an $8 billion James Webb Space Telescope (JWST) there, pretty soon, you’re talking about real money. In our austerity-hungry political environment, you need to navigate the complicated and volatile landscape of science policy if you want to explore the universe. You need answers to some simple questions: Who supports science? Why? By far, the federal government of the United States of America is the single largest sponsor of research in astronomy and astrophysics. Most money flows to astronomers through the National Science Foundation (NSF) and the National Aeronautics and Space Administration (NASA), although the Department of Energy also provides limited support for high-energy astrophysics. Unfortunately, understanding the history, priorities, and politics of these agencies usually involves wading through reams of legislation and dense policy documents—great if you’re looking for a sleep aid, but less than ideal if you’re a budding scientist seeking to understand your place in the world. In this post, I hope to provide a morsel of policy background, focused on the federal budget process. We’ll explore how money is divvied up to federal agencies, using the latest budgets for NASA and the NSF as examples. Future astrobites will delve into specialized topics and current issues in science policy. According to the Constitution, the power of the purse rests with Congress. As stated in Article I, Section 9, “no money shall be drawn from the treasury, but in consequence of appropriations made by law.” The Senate and the House of Representatives each have appropriations committees that allocate money, through twelve subcommittees, to fund federal agencies responsible for everything from homeland security to urban development. Science agencies like NASA and NSF are lumped together with the Departments of Commerce and Justice for appropriations purposes. You may have noticed that Congress rarely functions as you learned in civics class; when they fail to meet their deadlines for the orderly passage of appropriations bills, stopgap measures like continuing resolutions, where everything is funded at current levels, are frequently enacted. Congress must provide the final approval to spend money, but elected representatives don’t write budgets from scratch. Even if they wanted to, they probably couldn’t. The Senate and House combined have fewer staff members than most Cabinet departments, so they cannot micromanage every sprawling federal agency and the trillions of dollars they spend annually. So, Congress merely responds to a budget request from the President, which is traditionally delivered on the first Monday in February. Before the beginning of the fiscal year (FY) on October 1, Congress debates broad principles of budgetary policy, legislators earmark funding for their pet projects, and, somehow, legislation is passed to keep the country functioning. While Congress struggles to fund the upcoming fiscal year, federal agencies work with the White House’s Office of Management and Budget (OMB) to prepare the President’s budget request for the next one. First, each federal agency compiles its own pecuniary wish list with a bottom-up approach, starting with estimates from civil servants of what they need for their individual programs. Then, agency leaders like, say, the NASA Administrator and the NSF Director formulate integrated requests, ensuring that their high-level priorities are properly supported. Shortly before Labor Day, draft budgets from every federal agency are sent to the OMB. For months, the OMB staff negotiates with agencies and recalibrates funding levels to conform to the President’s overall goals. This entire process is secret; deliberations are embargoed so that the President may present his budget to Congress without any hint of internal discord. During the fiscal year, Congress bickers over appropriations for the next year, and federal agencies argue with the OMB over the budget request for the year after that. Science funding almost always flies below the radar of most members of Congress, except those whose constituents depend on federal grants for employment. So, Congress rarely modifies the nitty-gritty of allocating funding between different programs, facilities, and missions from the President’s original budget, although the absolute magnitude of funding may increase or decrease by a few percent. Therefore, the unelected bureaucrats in the executive branch who prepare the initial request wield tremendous power. This is often frustrating! Scientists are accustomed to open debate and to constant questioning of methods, results, and paradigms. We dream big, always imagining new ways to revolutionize our understanding of the universe, and we insist that our quest for truth is apolitical. However, the process by which the future of our field is determined is obfuscated, and often driven by earthly concerns like jobs. The last few decades have been a golden age of exploration. Our challenge is to continue to muster the resources necessary to make incredible discoveries. Unfortunately, when you turn on the news, you hear pundits lamenting the deficit, politicians rejecting the idea of raising revenues, and people generally anticipating decline. Signs are not good for bold new governmental initiatives. Years ago, during economic booms, people talked about dramatically increasing funding for scientific research to spur further innovation and growth. But, for modern budgets, flat is the new up. Enacted budgets in FY 2011 and 2012, along with the President’s budget request for FYs 2013 and beyond, for astronomy-related divisions of NASA and NSF AST. Funding amounts after FY 2012 are (thankfully) subject to change. Though the funds devoted to astronomy and astrophysics are miniscule compared to the entire federal budget, the amount of resources that taxpayers contribute to celestial exploration is still substantial. Each year, NASA and NSF spend nearly $3 billion on space missions, ground-based observatories, grants to individual researchers, educational programs, and the like. Specifically, in FY 2012, NASA spent roughly $1.5 billion on planetary science and almost $700 million on non-JWST astrophysics. The JWST program currently receives nearly as much funding as the rest of astrophysics combined. 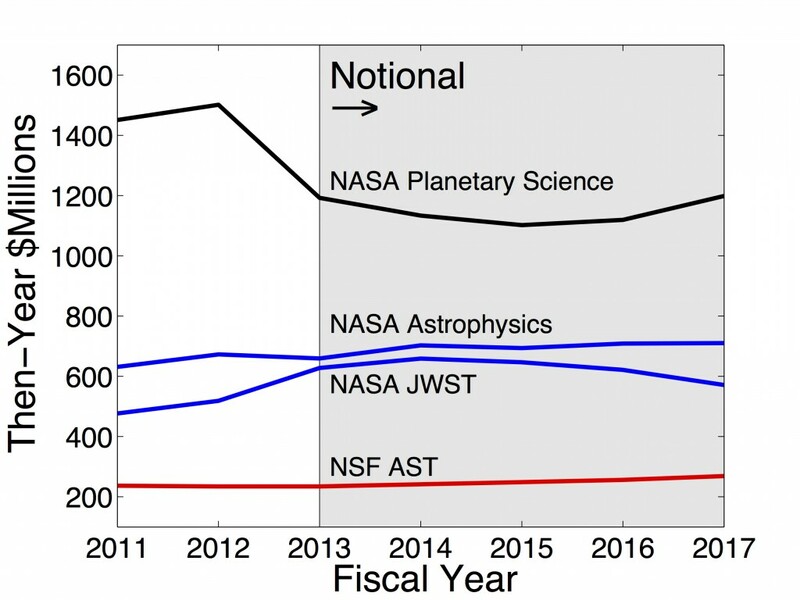 The NSF’s Division of Astronomical Sciences (AST) received just over $200 million in FY 2012, and funding is currently projected to remain flat for the foreseeable future. The budget for FY 2013 is still being debated, and the budgets for FYs beyond are only notional; planetary scientists, for instance, are working to fight proposed cuts to their NASA funding, which are focused on Mars exploration. President Obama’s recent request, however, does place JWST on a stable path to launch towards the end of the decade and ensures steady funding for astrophysics in NASA and at NSF. Science policy is, and always will be, complicated. My goal here was to demystify the federal budget process, but many issues that I mentioned above deserve posts of their own. Why did the OMB suddenly decide to slash Mars exploration? How can we do anything new with flat budgets, while still paying for what we have? Who gives advice to the people who write these budgets? I hope you’ll join me to continue exploring these issues. For now, please feel free to ask questions or to start a discussion in the comment section below.